Although the brutal warlord Oda Nobunaga was cementing his control over Japan, it wasn't enough to crub his thirst for power. Seeking immotality and to become a new demon king, he prepared a ritual at Honnou-ji in Kyoto. The feudal lords banned together and waged a fierce battle against the Oda forces in a desperate last bid to stop the evil lord. While the armies clashed outside, the legendary samurai, Hayato, fought his way into the temple and challenged Nobunaga himself in order to stop the ritual. While the two traded blows, a pillar of light erupted from the temple, transporting everyone that it enveloped into a strange world. Weakened by the unfamiliar energy of this world, Hayato must regain his strength and battle once more to prevent Oda Nobunaga's dark ambitions from spreading. Secondary Stat: Dexterity (DEX): This will increase your attack power less than Strength, but more than the other options. You can use the "Auto-Assign" function to allocate your Ability Points (AP) automatically. It will automatically put all of your AP in STR. Although Hayato is male as far as the story is concerned, you'll be able to play as female or male version of Hayato. Hayato must have one of his special katana equipped in order to use all of his skills. Make sure that the weapon type says "katana" in the item description. Since he is from ancient Japan and his primary language is Japanese, Hayato's voice is in Japanese. His animated video has subtitles, and he occasionally speaks when performing some skills. The female version of Hayato has also been given voiceovers when performing certain skills. Hayato can obtain the war horse Onikageh to ride after you complete certain requirements. You can get the Great Horse Onikageh mount skill starting at Lv.50. 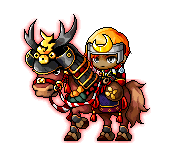 You can get the Sacred Horse Onikageh mount skill at Lv.200 if you've already learned the Great Horse Onikageh mount skill. Descriptions: Years of hard work given Hayato a preternatural understanding of the Katana, permanently increasing numerous stats. Permanently increases Speed +20, Jump +10, Avoidability +20%, Katana Mastery +60%, Willpower +30. Descriptions: Hayato's blade can cut through anything! Descriptions: The ultimate Battoujutsu technique. Blades rain from the sky, carrying the heat of the summer sun. MP Cost: 50, Damage 500%, Max Enemies Hit: 15, Number of Attacks: 6, +15% Continuous damage for 120 secs, Cooldown 600 sec. Descriptions: Permanently increases defence and damage. Increases your damage by +0.5% for every 100 Weapon DEF you have. Descriptions: Unleashes three measured strikes to slash up to four enemies. Descriptions: Hayato goes into a sheathed stance perfect for defensive strikes. It is an On-Off skill which activates and deactivates certain effect. Descriptions: One of the basic techniques of Battoujutsu. 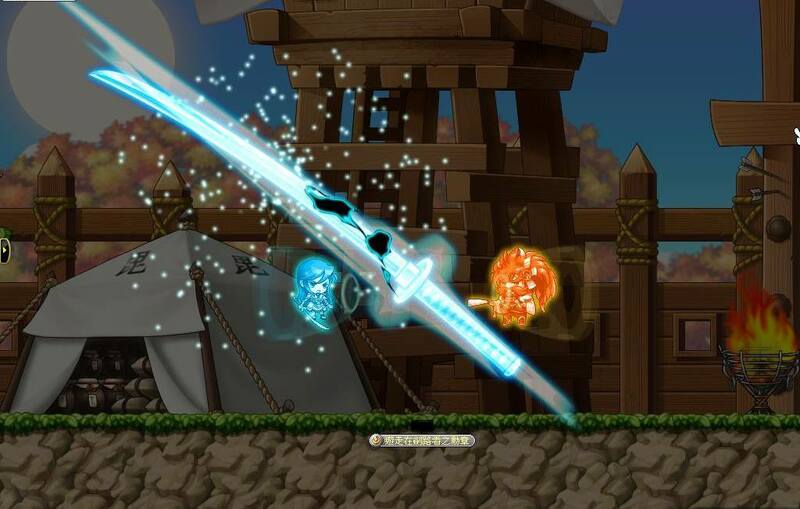 Dashes through enemies with an upward swing of the blade. Can be used four times in a row with no delay. Dash through enemies. Can be used 4 times in a row with no delay. At Master Level: MP Cost: 10, Damage: +100%, Max Enemies Hit: 4. Master Level: 15. At Master Level: Permanently increase STR by 30 and DEX by 30. Master Level: 10. Descriptions: A more challenging triple slash hits up to 5 enemies. Press the skill key to strike continuously. Descriptions: Hurls a mighty whirlwind forward to toss enemies into the sky. Chapter one of the Battoujutsu technique. Descriptions: Flashes through multiple enemies with deadly precision. Use directly after Shouryuusen to auto-target enemies in the air. At Master Level: MP Cost: 12, Damage: 170%, Max Enemies Hit: 6, Number of Attacks: 4, Dashes Forward. Combine with Shouryuusen for additional +20% damage and +100% Critical. Master Level: 15. Descriptions: Temporarily increases Max HP, Max MP, Physical Attack Power, Speed and Jump. Descriptions: A basic Battoujutsu technique that damages multiple enemies as you fly forward. Distance will increase with skill level. At Master Level: Damage multiple enemies as you jump up. MP Cost: 12, Damage: 100%, Max Enemies Hit: 8. Master Level: 5. Descriptions: Utilize supreme concentration to temporarily increase attack speed by 2 levels. At Master Level: Increase attack speed by 2 levels, MP Cost: 11, Duration 200 sec. Master Level: 10. Descriptions: Blade has been tempered and maintained with the utmost care. At Master Level: Permanently increases: Critical Damage: +25%, Accuracy: +120%. Master Level: 10. Descriptions: The fourth Battoujutsu secret technique. Appear behind the enemies and sweep through them, drawing them back to your starting position. Descriptions: The third Battoujutsu secret technique. Transform into a whirlwind of death as you rush forward. Send enemies flying into the air if you use it after Shouryuusen. At Master Level: Passive Effect: Shouryuusen, Dankuusen Damage: +50%, Active Effect: MP Cost: 33, Max Enemies Hit: 6, Damage 380%, Number of Attacks: 3, Combine with Shouryuusen for +100% Critical. Master Level: 20. Descriptions: Turns your blade into a tornado of steel, pushing all enemies around you to one side. Descriptions: Hoyato's secret technique. After dodging an attack, gain a chance to get boosted attack damage. Stacks up to 5 times. Gain chance of increase attack damage after dodging an attack. Stacks 5 times. At Master Level: Attack Boost Chance 60%, Damage 6%. Master Level: 10. Descriptions: Your attacks leave bleeding wounds, dealing HP damage over time. Bleeding doesn't stack and can't cause the target's HP to go below 1. Attacks leave a bleed effect dealing HP damage over time. At Master Level: Status Chance: +20%, Damage 150% every sec. Duration: 5 sec. Master Level: 10. Descriptions: Improves Battoujutsu Stance and damages nearby enemies. At Master Level: Improves Battoujutsu Stance: Stun Chance: +40%, Nearby Enemy Damage: +160%, Permanently increases: Attack: +20. Master Level: 20. Descriptions: This Battoujutsu technique was once believed to be lost. After dealing a critical hit, get a chance to recover some HP. Descriptions: Deal three devastating slashes against up to 4 enemies. Has a chance to deal extra damage. Descriptions: Focuses your fury and skill to attack a single enemy. At Master Level: MP Cost: 28, Damage 162%, Number of Attacks: 10. Master Level: 30. Requires Mastery Book. Descriptions: Not quite punchy, but close enough. Leaps high into the air and dives down katana first. At Master Level: Passive Effect: Shouryuusen, Dankuusen, and Whirlwind Cut Damage: +100%. Active Effect: MP Cost: 45, Max Enemies Hit: 8, Damage 190%, Number of Attacks: 6, Stun Chance: 100%, Stun Duration: 10 sec. Stunned Enemy Damage Taken: +110%. Master Level: 20. Requires Mastery Book. Descriptions: The ultimate in destructive blows. Attacks multiple enemies with a guaranteed critical. Can instant KO enemies, and Hayato's critical rate increases for a short period after use. At Master Level: MP Cost: 142, Max Enemies Hit: 15, Damage 455%, Number of Attacks: 8, Guaranteed Critical Attack, Critical Rate Increase: 45% for 40 sec. Cooldown: 90 sec. Has a chance to instantly KO enemies. Master Level: 30. Requires Mastery Book. Descriptions: Temporarily increases abnormal status resistance and elemental resistances. Temporarily Increases Abnormal status and Elemental Resistances. At Master Level: MP Cost: 130, Duration 180, Abnormal and Elemental Resistance: +50%. Master Level: 20. Requires Mastery Book. Descriptions: Hayato's secret technique. After successfully avoiding an attack, grants a chance to reduce incoming damage for a time. Reduces incoming damage for a time after avoiding an attack. At Master Level: Trigger Chance: 35%, Damage Reduction: +45%, Duration: 8 sec. Permanently Increases Avoidability by 40%. Master Level: 30. Requires Mastery Book. Descriptions: Your blows cleave through armor to deal more damage. At Master Level: Defense Ignored: +35%, Damage: 30%. Master Level: 30. Requires Mastery Book. Increases stats of all party members. At Master Level: MP Cost: 70, All Stats: +15%, Duration 900 sec. Master Level: 30. Cures all abnormal status: At Master Level: MP Cost: 30, Cooldown: 360 sec. Master Level: 5. Descriptions: A technique passed down from the Battoujutsu masters. Grants a chance to parry an enemy attack and dish out damage in return. Increases bleed damage of Merciless Blade. At Master Level: Status Chance: +30%, Damage 170% every sec. Duration 5 sec. Master Level: 10. Descriptions: Increases the bleeding caused by Merciless Blade.